Cause for Alarm! is a classic film noir from 1951. This film is directed by Tay Garnett, who returned to his noir roots 5 years after The Postman Always Rings Twice. Though these are two very different films and Postman always gets the attention from noir fans, this film holds up on its own. This film revolves around Loretta Young’s Character, Ellen. Ellen’s husband, George, played by Barry Sullivan is very ill and is bed ridden. 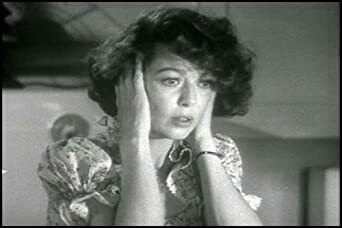 This film starts out with Ellen doing housework and with a classic noir voice over, Ellen starts to tell the story of the worst day of her life. The film flashes back to when Ellen worked for Dr. Ranney Grahame, played by Bruce Cowling and meets the Doctors good friend George. This flashback has a bit of romantic comedy feel to it, but as we return to the main story, things start to get very dark. We find George is having some strange thoughts about his old friend, Dr. Grahame and his wife. Is George right or is he imagining things in his sickened state? Is his Wife and Doctor trying to kill him? I really enjoyed this film, but feel most non-film noir fans will not. Though this has some comedy elements in it, especially the flashback scenes, it is a very claustrophobic film with pending disaster at every corner. That being said it definitely has a feel of a modern situation comedy. In fact this film was cribbed from for an episode of Three’s Company. I feel a remake of this film would be very difficult to do in today’s cinema with the same sense of frustration and pending doom. This film is also unique in taking the traditional noir back streets of the big city out of the story and slapping it into suburban America. Favorite Tidbit: Loretta Young has a great performance in this film, and she worked really hard to earn the role. Her husband, Tom Lewis, was the producer of this film and wanted Judy Garland for the role. Young wanted the role so bad, that she got a lawyer who told Lewis, he was discriminated against Young because she was his wife. He folded and finally hired his wife for the role.